1. Lisa's dad used to have a lot more hair. 2. His tux for the wedding has expired. That's not exactly it, but it's in the right ballpark. 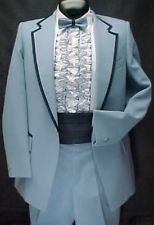 It's worth noting that for the most part if you do a google image search for powder blue tuxes, mostly what shows up is costume ads. If you just look at the photo, you can get a pretty good idea of when the photos were taken. And it's not just the tuxes, either. It's what the other folks are wearing. Or what their eye shadow looks like. Or how long the tail fins are on the cars. If you lived during a given decade, you might even remember what you looked like when you dressed that way. Maybe you had a favorite pair of bell-bottoms or disco platforms. 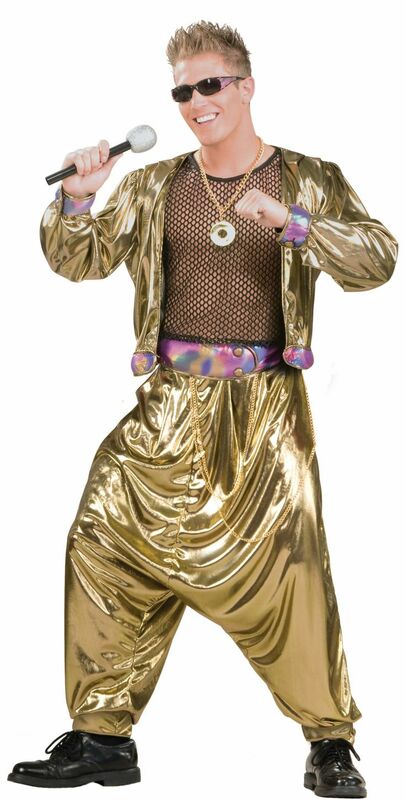 I'll bet you absolutely ROCKED those MC Hammer pants. This guy is not pulling it off like you did. I'm boring. I never really got into the trends much. About the only thing I ever cared about were my glasses...and I just wanted those to look like my dad's. I was never hip, cool, or stylish. Never had the Umbros. Never wore the Starter jacket. Never spent 3 paychecks on a pair or Nike's. It's not because my parents said no. I just didn't care to. Like I said. Boring. Boring and unpopular. In part that was because I was still learning that correcting peoples' grammar was not as endearing as I imagined (one thing on an extensive list of things Lisa taught me). But in part it was because I had no real desire to fit in. I was an outcast...on purpose...and not in the trendy way they are sometimes portrayed on TV now. The tux I wore at our wedding consisted of standard black tails with a deep purple paisley vest that matched the bridesmaids dresses. Boring. It was a little more purple than that, but that's about right. Imagine that with tails. If you come to my house, we have white trim with solid color on the walls. Boring. My car is boring blue. I usually wear khakis and a polo or long sleeved-plaid in the winter. I wear a solid shirt with a tie on Wednesday and Sunday. Boring. But being boring has its advantages too. One day someone might look at a picture of me and laugh a the goatee or the hair, but it's highly unlikely that someone's going to look at a picture of me and say, "The 90's called, and they want their jacket back." People have been wearing black tuxes with accents colored to match the bridesmaids for...a long time. We were talking about the upcoming solar eclipse in the workroom today, and you can probably guess that someone started singing "Total Eclipse of the Heart." Because of course. That got me thinking about the literal video for the song, which as absolutely nothing to do with this post, but is about the funniest thing I've ever seen on YoutTube. (If you're ok with some mild adult content, see it here:Funniest Youtube Video Ever.) It also got me thinking (because my brain has a short circuit) about a religious pantomime from the what, early 90's? Another quick youtube search shows me it has been updated for the 2000's. Here it is. The presentation and theology in this video date it. There is a lot about our church and theology that reveal when (and where) it is located. If you made a photo album, one day you might be able to look back and say, "Yes, I remember when that's how we did it. Do you remember when everyone in the church was focused on soup kitchens?" Or medical clinics. Or camp meetings. Or revivals. Or large Sunday School classes. Or increasing the number of small groups. I've complained about all the "5 Things Your Church Needs to do RIGHT NOW" kinds of articles before. Let me be clear: those ideas are being published because to some extent or another they actually work, so there may be some wisdom in following them. I mean this in the nicest, most lovingly Christian way possible: I don't care what everyone else is doing. I keep coming back to a single question: with respect to our faith, what is timeless? What is essential? What is the faith equivalent of solid walls and white semigloss trim with a flat white ceiling? Think about that wedding album again. Yeah, the tuxedos are amusing. And the hair. But you know what else you can see? A marriage built on love that began about 25 years before my own marriage and continues to this day. A commitment to living and working and staying together no matter what occurs. That day, Lisa's parents vowed to be together until they are parted by death. So far, so good; she hasn't killed him yet (though I understand it is occasionally touch and go)! That's what that album represents. It's what almost all wedding albums represent. Even if the marriage doesn't end well for one reason or another, on the day those pictures were taken, and on the day they were put together in a book to remember, there was a commitment to pure, timeless love. Oddly enough, I think it's that very same love that is at the very core of our faith. Love is the essential. It's the timeless component, the thread that weaves through each age. Admittedly there have been seasons in the church when the thread has been obscured by some pretty horrible things. There always will be. Like Dalton says, church was perfect until we walked in, right? But when we get it right, there is Universal Love. It's more than the timeless part of our faith. It is the core on which our whole faith is built.